Safe operation, enhanced mobility, and easy storage are just a few of the reasons why these tables are perfect for businesses, schools, or conference centers. Pneumatic lift system features torsion bars that offer easy, controlled folding and unfolding. Carefree high-pressure laminate surface is surrounded by a unique Perfect Edge that seals out moisture, bacteria, and dirt. 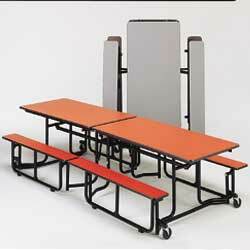 Wide high-pressure laminate benches are supported by uniform diameter tubes with gussets for strength and durability. Unitized all-steel frames with 4" swivel casters and non-marring nylon glides. 10-year warranty. UL-listed. SPECIFY COLOR: CH - Charcoal, GY - Gray, OK - Oak, RD - Red, SD - Sand, WL - Walnut. GY - GRAY, RD - RED, WL - WALNUT ARE IN STOCK. Others FOB MISSISSIPPI.